Please pay at the door. If you must cancel, please do so prior to March 17th. On Tuesday, March 22nd, NIFA will hold its annual dinner meeting at the Naaman Diehl Auditorium adjacent to, and behind, the Farm Bureau building in Mount Carroll starting at 7 pm. Jackie de Batista will explain the University of Illinois Extension Service's Master Naturalist Program as well as discuss ways to involve your children and grandchildren in your woodland activities. The dinner will be catered, buffet style. The registration fee, which includes dinner, is $12 and can be paid at the door. 1) click the Registration Button on the left. 2) email our treasurer at pouzar@yahoo.com, indicate the "NIFA Annual Dinner Meeting" and include your name and the number in your party. 3) call our treasurer at (815) 777-8157, mention the "NIFA Annual Dinner Meeting" and include your name and the number in your party. 4) Mail your name and phone number or email address with a check for $12 for each person attending to NIFA Treasurer, 2303 West Cording Road, Galena, Illinois 61036. 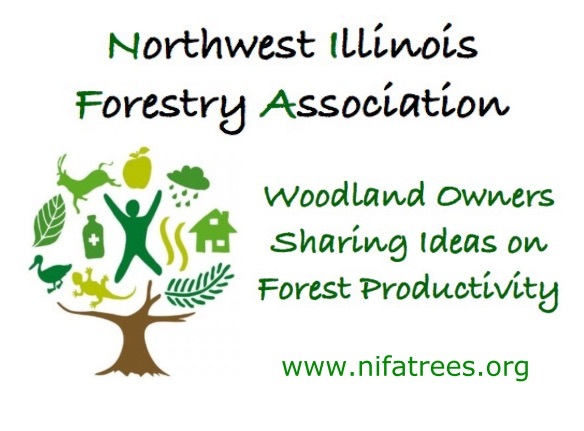 The check should be made payable to the Northwest Illinois Forestry Association. This dinner meeting will be held at the Naaman Diehl Auditorium at the Farm Bureau Building in Mount Carroll, located just north of Routes 52/64 on the west side of Route 78. A map can be found HERE.